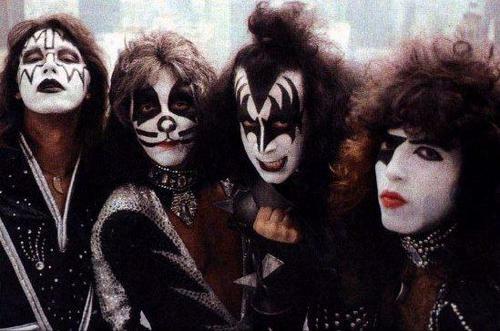 The Rock and Roll Hall of Fame will rock and roll all nite (sorry) when the original members of KISS are inducted into the hall on Thursday, April 10th. We figured you all know the deal on this band and their 40 plus years of chartbusting hits and wild pyrotechnics, but here’s a few music videos that may have slipped by you. A song that would have sounded at place on the Grease soundtrack, this clip showcases a tease at the band’s still unseen faces, because it’s from the Unmasked album! Get it? Ace Frehley takes the vocal spotlight on this one. A hit in Switzerland! KISS had a highly derided concept album, but KISS found an unlikely writing partner in Lou Reed, who actually only contributed the line “A world without heroes, is like a world without sun.” Don’t miss the only tear ever shed by the lead vocalist on this one, Gene Simmons. Directed by Paul Rachman, here comes Gene Simmons at his sleazy best. Here’s a wild one: the band of former KISS guitarist Vinnie Vincent records a song for the Nightmare On Elm Street 4 soundtrack. That’s Mark Slaughter (of Slaughter) on vocals.